In order to understand the CCNA wireless topics it's very essential to go through the following basic wireless physics concepts terms. So I have just added the notes and an image for every term to help to understand the topics better. The number of times the signal makes one complete up and down cycle in 1 second. 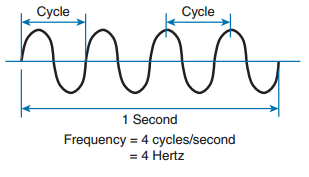 Frequency is related to bandwidth as it tells how many cycles per second. 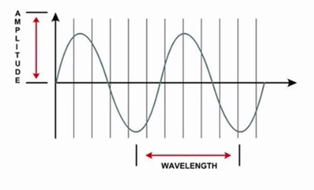 The wavelength is a measure of the physical distance that a wave travels over one complete cycle. Wavelength is usually designated by the Greek symbol lambda (λ). The wavelength decreases as the frequency increases. For an RF signal to be transmitted, propagated through free space, received, and understood with any certainty, it must be sent with enough strength or energy to make the journey. This strength can be measured as the amplitude. The strength of an RF signal is usually measured by its power, in watts (W). For example, a typical AM radio station broadcasts at a power of 50,000 W; an FM radio station might use 16,000 W. In comparison, a wireless LAN transmitter usually has a signal strength between 0.1 W (100 mW) and 0.001 W (1 mW). The relationship between two signals based on when their alternate current levels are rising and falling. The frequency range from around 3 kHz to 300 GHz is commonly called radio frequency (RF). It includes many different types of radio communication, including low-frequency radio, AM radio, shortwave radio, television, FM radio, microwave, and radar. The microwave category also contains the two main frequency ranges that are used for wireless LAN communication: 2.4 and 5 GHz. Below figure shows the channel assignment for the 2.4-GHz band that is used for wireless LAN communication. The band contains 14 channels numbered 1 through 14, each assigned a specific frequency. I guess the above notes were helpful, In the next post I will cover the RF Maths.